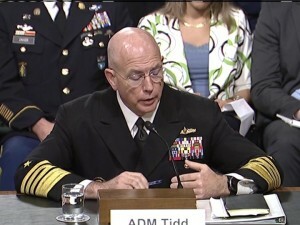 WASHINGTON - The commander of US Southern Command (SOUTHCOM), Admiral Kurt Tidd, while testifying before the Senate Armed Services Committee on Thursday, as part of SOUTHCOM’s annual Posture Statement to Congress, noted that the deteriorating situation in Venezuela could prompt a regional response. He also noted that the Russia Today television channel spreads misinformation to discredit the United States. “Russia seeks to discredit the United States through state-owned media like RT-Español and SputnikMundo, which spread misinformation to create doubts and distrust about US intentions and policy towards the region and other parts of the world,” Tidd said. He said that the Russian government resorts to what he described as soft power tools to challenge US leadership in the Western Hemisphere and displace what he termed “traditional US goodwill initiatives”. Meanwhile, on Saturday, Venezuelan police fired tear gas at anti-government protesters, as demonstrations against President Nicolas Maduro continued in the capital Caracas. Maduro's government has said a US-backed business elite is responsible for Venezuela's economic downturn, and is trying to foment a coup to impose right-wing rule. “Using repression, intimidation and terror as a tool of the enforcement of power is the clearest symptom of the weakness of the regime,” he said. “I call on the government of Venezuela to release political prisoners and to reinstate leaders as an immediate and inescapable step toward free elections,” Almagro added. On Monday, the council of foreign ministers of the Bolivarian Alliance for the Peoples of the Americas (ALBA) regional bloc will meet in Havana. This council is the advisory mechanism for the heads of government of the regional integration entity, founded initially by Cuba and Venezuela in 2004.